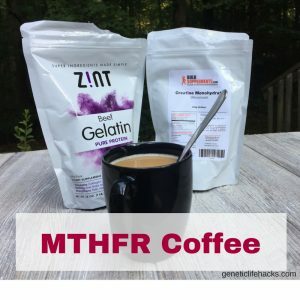 There are quite a few studies showing that women carrying certain MTHFR variant combinations are at a somewhat higher risk for miscarriage, but I recently ran across a study that added a new twist to the topic. 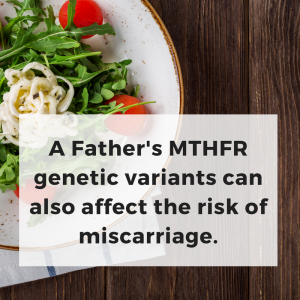 It turns out that the father’s MTHFR variants can also play a role in recurrent miscarriages. The study from 2015 looked at 225 couples with more than three consecutive pregnancy losses compared with 100 control couples with successful pregnancies. All 225 mothers in the pregnancy loss group carried either compound heterozygous MTHFR C677T and A1298C variants or homozygous C677T or homozygous A1298C. The study defined carrying just one copy (heterozygous) of either C677T or A1298C as being at a low risk for miscarriage. Dads matter – in conception, pregnancy, and throughout life! It is easy to see how prospective moms need to clean up their diets, exercise, and sleep well before getting pregnant, but I think these studies are a good reminder that prospective fathers need to pay attention to their own health as well! MTHFR variants (read more here) increase the need for ensuring adequate folate consumption. This means leafy green veggies, legumes, and other organic food sources of folate need to be eaten daily. If you won’t make the necessary dietary changes, there are methyl folate supplements as well. A quality B12 is also important, and many people find it convenient to take a B-complex to cover all the bases. Here is one that I like: Jarrow B-Right. But you may find other options that are a better fit for you. This may be a ‘talk to your doctor’ situation if you have a physician working with you on family planning. I know – telling some guys to talk to a doctor is like banging your head against the wall, but if recurrent miscarriages or infertility are a problem, this really may be a time to get some professional help. Association of Methylenetetrahydrofolate Reductase C677T and A1298C Gene Polymorphisms With Recurrent Pregnancy Loss in Syrian Women. Comparison of two preventive treatments for patients with recurrent miscarriages carrying a C677T methylenetetrahydrofolate reductase mutation: 5-year experience. Association between the MTHFR C677T polymorphism and recurrent pregnancy loss: a meta-analysis.